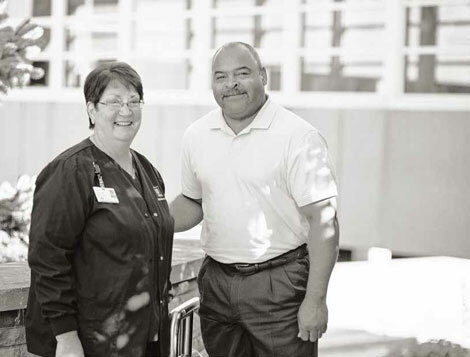 After many visits, to many states, to see many aides, nurses, assistants and doctors, Anne Todd, of Southern Indiana Physicians IU Health Oncology, has managed to show us what patient care is all about. THE JOURNEY has been long and hard, and the light at the end of the tunnel appears to be an oncoming train instead of a ray of hope. After many visits, to many states, to see many aides, nurses, assistants and doctors, Anne Todd, of Southern Indiana Physicians IU Health Oncology, has managed to show us what patient care is all about. And that oncoming train has miraculously left the tracks. IT ALL began with a CT scan to check the esophagus. There is no way we could have expected or been prepared for the results … esophageal cancer at the GE junction. Upon further examination, the cancer had spread to the liver, as well. Being stage 4, we knew the odds were not in our favor and there was no real cure. It is amazing how quickly your life turns upside down when you receive news of cancer. And, you are not the only one affected. Your family members, friends, loved ones, work colleagues and the list goes on. There are so many good oncology teams in this country treating cancer, and it is difficult assessing the abilities of the caregivers knowing that there can never be an apples-to-apples comparison based on the needs and differences of each and every patient. We have traveled the Midwest seeking care, so we have experienced many differences in patient care. Many years ago, my golden retriever was very ill, so I carried him to my vehicle and took him to the vet. Upon arrival, the doctor came to the back of my vehicle, crawled in, held him and cried. I tell you this story because that is the standard that I set in all care. The bar can never be set high enough when it comes to patient care. There have been many who have come close; however, Anne Todd has reached that level of care and concern for her patients. Anne has given professionalism a new meaning. Yes, it is one thing to be professional; however, it is something completely different when professionalism is blended with compassion, care, empathy, concern, understanding and overall awareness of the needs of those she is serving. A good meal can be quickly ruined by poor service, just as with patient care. Outside of the appointments, Anne calls on a regular basis to make sure everything is OK and ask if there is anything she could do to make the family more comfortable. Anne made arrangements wit her church to help supply needed funds to purchase nutrition since the insurance company did not cover this expense. Anne also pulled together a few of her friends and came over to help clean the home, do laundry, and though she claims not to know what to cook, she offered to prepare food as well. The thing that stands out most in my mind is what Anne did outside the office. Anne, with a few others, made arrangements to send the family to Disney World over the Christmas holiday. With medical bills, medications and other expenses, there is no money for things like trips or even Christmas gifts. Anne and her friends made sure there was a Christmas for the family. Nothing was left undone. Transportation, lodging, money, medication and nutrition were all arranged so the family could enjoy this precious time together. Anne and those involved were not part of the rich and famous (though they deserve to be). They gave up time-shares, frequent flier miles and took up a collection to make sure the family wanted for nothing during this trip. I was taught the best thing you can do for another is to give of yourself, and that is why I truly believe Anne Todd has risen to that standard. Anne gave of herself to one she only recently met. She pulled together resources that seemed impossible to create a memory for those left behind to cherish for a lifetime. I will close by reciting a quote by Julian of Norwich: “A cheerful giver does not count the cost of what he gives. His heart is set on pleasing and cheering him to whom the gift is given.” Anne has earned my respect, trust and admiration.